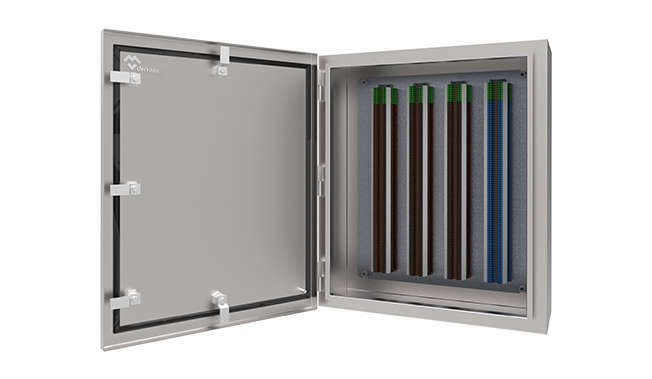 The terminal box with Terbox-Luxorex Series closures and hinges have been developed with a LOM 14ATEX3026U component certificate, sturdy and IP66 tight. These boxes can be used with increased safety protection mode “Ex e” including increased safety connection terminals or “Ex t” envelope protection mode. LOM17ATEX1011. These boxes stand out for incorporating Atex & IECEx components already installed inside them, without needing to re-homologize in a laboratory once ssembled. There are solely valid for flammable dust environments those stations where all the built-in components are suitable for group III. Simple door opening with double bit fasteners. Polished finish on all sides. Large interior space that simplifies connection operations. Atex & IECEx components already installed inside. Great safety and resistance in the most aggressive explosive environments thanks to the design and materials used in its manufacture. Boxes used as maneuver stations, incorporating certified components of connection, maneuver and signaling: pushbuttons, emergency mushrooms, lights, pushbuttons. Boxes used with enclosure protection mode. These control stations may be used for connection of intrinsically safe circuits but not in combination with non-intrinsically safe circuits.